Paphiopedilums are tropical orchids, also known as lady slipper orchids, commonly attacked by a fungal pathogen that causes black root rot. This problem is severe and causes significant damage that may include the loss of your orchid. 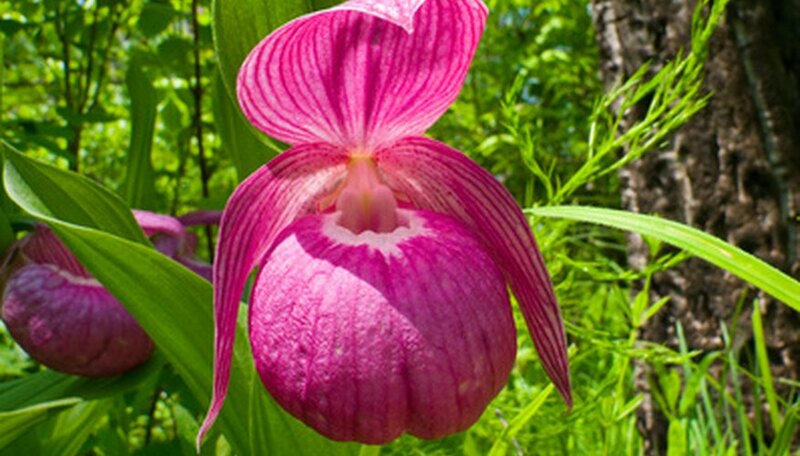 Familiarize yourself with the types of things to look for as well as what action to take if your paphiopedilum falls ill to help it regain health in your home flower garden. Vigorous orchids have a better chance of avoiding or combating fungal infections that cause root rot than orchids under poor care and stressed conditions. Grow your paphiopedilum orchids in low to moderate light; if growing indoors, place in a window facing east or north, according to the Colorado State University Extension. These orchids thrive in well-drained commercial potting mix formulated for terrestrial orchids. Root rot disease in paphiopedilum orchids is caused primarily by the fungal pathogens Phytophthora palmivora and Phytophthora cactorum, according to the University of Florida IFAS Extension. The pathogens infect the potting media, so much like soil-borne fungi; pathogens infect plants by invading the root system, infecting the roots and pseudobulbs and spreading into the rest of the plant. Black root rot of orchids leads to lesions, or areas of dead tissue, that form on roots of the paphiopedilum orchid. The lesions spread to the plant's bulb and work their way up into leaves. Lesions are black hued and, in severe cases, they overtake the entire plant and result in plant death, according to the University of Florida IFAS Extension. Destroyed root systems inhibit normal absorption of essential nutrients and water, so even before damage has occurred on the rest of the plant due to the spread of pathogens, the entire orchid is already in a state of decline. Soil-borne fungal pathogens spread in water and affect healthy plants in close proximity to infected plants. Pathogens are also easily carried and transmitted on contaminated equipment. Keep in mind other highly susceptible plant hosts along with paphiopedilum for a list of plants to avoid adding to your flower collection to prevent the increase of root rot problems. Other orchid genera include, but are not limited to, Maxillaria, Aerides, Brassavola, Dendrobium, and Phalaenopsis as well as Cattleya orchids, according to the University of Florida IFAS Extension. For control of root rot on paphiopedilum orchids, always use sterilized pots and fresh, pasteurized potting mix. Sanitize pruning tools between each cut and from one orchid to the next to inhibit transfer of disease pathogens. For chemical control, apply a fungicide with the active ingredient foestyl-AL or mefenoxam to reduce the severity of the root rot infection. For eradication of the disease, the potting media must be destroyed, according to the University of Florida IFAS Extension.